A fictional account of the rise of the Kerbal people, in Universe 23-phi-alpha-9, their journey into space, and the history that led them to this historic moment. In fact, random fictional writings inspired by play-throughs of Kerbal Space Program. Early this morning, exactly 1 year, 56 days, 5 hours, and 33 minutes into its historic inter-planetary excursion to Duna, the Ludwig L was lost, crashing into Duna's moon Ike. The event can only be described as a tragic miscalculation and a technical failure, during an entirely expected orbital insertion around the small moon. Kerbin and the Mun visible behind. The maneuver was intended to save fuel by using Ike to slow the craft before final insertion into a highly eccentric orbit around Duna. Final broadcasts relayed from the Ludwig paint a horrific picture of the miscalculation and its consequences. Due to a combination of two software errors, including one in a backup system designed to prevent exactly this sort of thing, the early state of the Ludwig's instruments, and night-side visibility issues, the crew was unaware of their danger until very late, and were unable to recover from the fatal combination. Live audio from the RemoteTECH intercom system showed Commander Jebediah Kerman urgently working with co-pilot Valentina Kerman to reorient the craft and bring up the JKJ LV-N "Nerv" atomic rocket, which should have been adequate to the task. Unfortunately, the orientation of the craft was wrong for this emergency procedure, and there was insufficient time to reorient. The crew was a model of competent professionalism to the end, never ceasing to work the problem, according to Administrator Japheth Kerman. In a sombre press conference, he praised the lost crew, reiterating the resolve of the Kerbal Space Program to explore and research. The tragedy has deeply affected the people of Kerbin. National Governments and people in the Autonomous Regions alike have voiced their sadness and resolve (except the Folsisch Republic, but no one expected those jerks to say anything nice to anyone. We anticipate their "we told you so" smug think pieces with eyes pre-rolled). The crew's families have, to a Kerbal, indicated their pride in the crew, and their hopes that the kerballed missions should continue, and that their dearly departed family members perished doing what they loved, pushing forward the knowledge-base of an explorer people. The Ludwig, named after political economist Ludwig von Kerman, was the first staffed inter-planetary mission of the newly federated Kerbal Space Agency, and all of Kerbin had been locked to social media for many of the mission highlights, as Kerbal-kind made its first, tentative steps beyond the influence of the homeworld. The first ship of its class, it was a marvel of the latest technology, only lacking where better tech has been developed in the year and a half since launch. deaths in the Kerbal space exploration program. The five brave pioneers lost to us are, of course, well known. Pilots Jebediah "First Post" Kerman, Valentina Rosita Valentinova Kerman and Leeroy J. Kerman capably helmed the historic mission. Engineer Bill "Canny" Kerman, and Scientist Bob "Boffin" Kerman kept the ship operational and expanded our understanding of the universe. They will be remembered among the great heroes of space exploration. Bob, a Kerbal of rare courage and even rarer lack of stupidity will be especially missed. His groundbreaking theories concerning the cosmic background radiation stunned his much stupider peers. Valentina was the first Kerbal to orbit the homeworld, and the first to land on the Mun along with Bob. Jebediah was, of course, the first to walk on Minmus (and will never live down his "first post" flag, which remains there to this day. Leeroy piloted the second mission to Minmus with Bill, which was the first long-term space habitation, the two living in their lander on Minmus for a month. 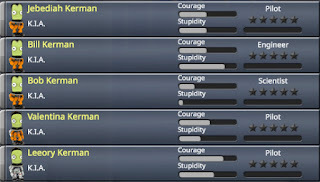 William Kerman is, of course, known for his having narrowly averted a melt-down at the Kernobyl nuclear power plant in '97. 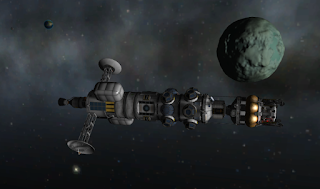 The crew lived together for about a year, before mission start, in an orbital training station based on the original Mun and Minmus motherships. They prepared themselves for the long journey while the Ludwig was assembled in orbit. Newly produced life-support options from Umbra Space Industries were crucial, both to making livable space stations, as well as a craft in which the crew could spend the three year trip to Duna. Apart from being the first non-robotic inter-planetary mission, the Ludwig L's maiden voyage was also the first fully public share space operation. While several firms have Mun, Minmus, and orbital operations or joint ventures in the works, the publicly funded Ludwig missions have been seen as a key wedge into highly speculative research and science. Older firms see too much risk in being the first mover here, while newer firms like Kerbal Aerospace, and KerbalX simply don't have, on their own, the capital concentration and operational experience to put the mission together. Given the Walace Kerman Act of '22 in effect in the USK, similar legislation in the KU and KFR, leave alone the Autonomous Regions, securing funding was thought to be challenging by detractors. And fair enough, since we all remember the stupid, stupid USKA/KUSA space plane boondoggle. So, the decision by the coordinating team and the federated KSA coordinating workshop to open funding up to a mixed-mode smart-kontract shares sold to the public to make up the shortfall from the usual foundations and endowments was controversial. While hedge-funds and interested firms bought kontract shares, the general public broke remarkably back into the funding mix. In light of general enthusiasm for the Mun and Minmus missions of four years back, a majority of the funding has been either match-donation allocations or fractional shares of smart-kontract escrow-held profits, from individual Kerbals. Despite today's tragedy, analysts have noted that Ludwig L kontract parties are expected to recoup most of their losses, as data collected en-route has already resulted in new lines of development widely considered actionable under the Ludwig kontract. Kontract parties should see fractional profits in digital escrow within the next two years. Smart-kontract shares in the upcoming Ludwig missions have remarkably spiked, after this morning's news, indicating the confidence Kerbals have in the program's ability to return value to Kerbal-kind, even in the face of tragedy. Koogle senior SRE Mikey Kerman has hinted that he may take a leave of absence to help make sure that the ops on the software side are well covered. Mikey was, of course, made famous by his role in keeping the orbital AC data center from dying in a fire, despite its ludicrous mis-design. Work had already begun on the the Ludwig ECSC, the successor craft to the Ludwig L, originally intended to go to Eve, now re-directed to complete the original mission to Duna. The core design will be maintained, but with notable structural and technological upgrades. Apart from the basic superstructure upgrades (see Lisa Kerman's fantastic article on Karbolic Steel-Ceramic hybrid materials), the ship will sport the next generation of USI life support systems and a newly miniaturized, but well tested USI reactor for primary power. Parabolic Industries' long range KerbNet dish has been slated for this mission as well, making for improved mission networking. Other notable improvements are the use of Mainsail lifters, and KerbalX's lower stage reusable boosters, which are predicted to drive down launch costs dramatically for this mission. From crisis to victory, the Ludwig ECSC is expected to be twice the ship for two thirds the cost. The showpiece of the newer craft, however, is the Integrated Intervals mobile laboratory which, aside from providing a bit more room for the crew, is a complete research center, allowing on-site research without the lag and lack of local access by scientists. This is expected to shift the mission dynamics. Instead of three pilots, an engineer, and one scientist, the new Duna mission is expected to send two pilots, one engineer, and three scientists up, one to do lander missions, and two to work the lab. Boris Kerbal, chief analyst at Kerbal Research Dynamics Consulting has hinted at the slate of experiments and research planned, and expects at least two of seven research planks to bear direct return on investment. 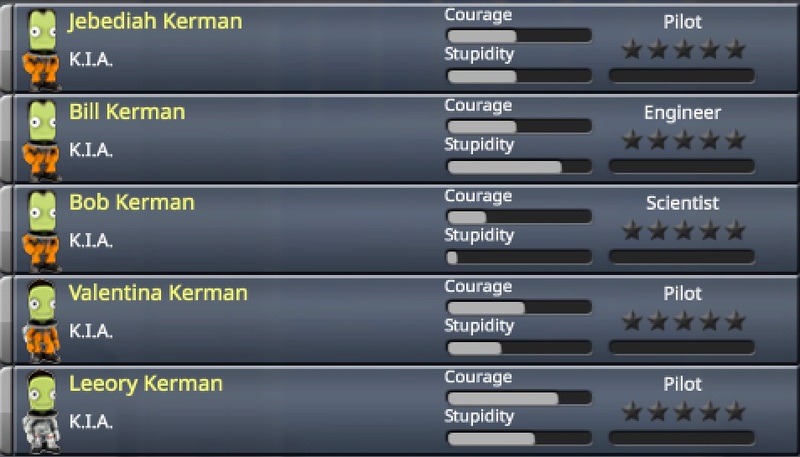 The late Bob Kerman's eldest daughter, Billy-Jeanne Kerman was overheard at the press conference, saying, "Holy crap, we're sending three of my dad to Duna? Duna doesn't stand a chance. Prepare to be scienced, red planet!" As their families have said, we will carry on. A grateful people honor their service, their courage, their lack of stupidity. They were the best of us, but we will become better. Christian E. Kerman is the science and technology editor at TekBrunch, a weekly publication of Rupert Kerman Industries. He is a former software engineer at KerTube and Koogle, and writes about science, technology, physics, komputer science, economics, and the space program. Disclaimers: The author has smart-kontract shares in the Ludwig missions, and is not providing investment advice. The author has not been paid by any firms mentioned in this piece, with the exception of a small software consulting job done for USI.